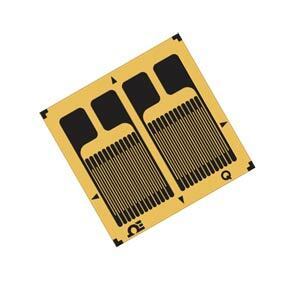 OMEGADYNE® offers Karma K-Series dual linear strain gage patterns. These strain gages can be used for bending beam transducer designs where you have access to both sides of the beam. Each carrier has 2 separate parallel linear strain gages. Precision Karma material offers excellent temperature and fatigue characterisitcs. K-Series gages have plated solder pads which make soldering quick and easy. No special solders or fluxes are required.